It might be the season to be jolly, but with how hard it can be to choose the perfect gift, it’s also the season of high stress. Gift guides are impersonal, and one person’s top 10 list might be another’s nightmare return. In fact, one Deloitte study showed that in 2015, nearly 30% of the $64 billion spent online buying presents for the holidays online were returned, while a 2017 study said gift cards were likely to be the top purchased items that season. This year, however, finding meaningful gifts can be a lot easier, thanks, in part, to AI. Here are 3 businesses using the technology to help you find gifts everyone on your list is sure to love! Want to learn more about how AI is impacting retail? Download the "How to Drive Revenue with Computer Vision AI" guide! Token’s sleek site asks users to complete a simple sentence using some pre-selected categories, so their machine learning algorithm can learn everything from the giver’s budget to details about the recipient, like their relationship with the giver, gender, personality, and interests. Customers can then browse and buy selections, narrowed down from over 1000 brands and retailers, directly through the site, with Token also offering gift wrapping and delivery and even allowing users to add a personal note. The capabilities of AI allow the technology to learn and improve over time. For Token, that means users can respond to its first set of suggestions, choosing whether they want more suggestions of this nature or “something a bit different”, and their platform will take the necessary action offering similar or different suggestions for the giver to peruse through. So, whether you’re looking for an “impressive” present for your “healthnut” “boss” or something “quirky” for your “trendsetter” “friend”, Token’s AI platform is here to help you find a gift for everyone on your Christmas list this holiday season. Uncommon Goods has long prided itself on offering customers handmade items from independent sellers. Now, with its AI-powered gift finder, it’s helping customers find the perfect presents for their loved ones. After a user tells “finder” the age of and their relationship with the recipient, they then select from a group of pre-listed interests and can even add some of their own. From there, the algorithm makes its suggestions, asking users to “star” items that interest them so it can learn and make more relevant recommendations based on these favorites and the actual purchases of customers who starred similar items. After its launch last year, the retailer found it to be a hit with users. Allowing gifters to add interests led to more unusual search queries that, in turn, can help the company improve their inventory. While conversion rates of people who used and didn’t use the gift finder were similar, the purchases of those who used the finder were 45% higher in order value. While people are buying more expensive gifts, it’s also possible that this uptick is because the AI is suggesting gifts that are more aligned with the tastes of their loved ones. Businesses across the world are using AI to build smarter products. 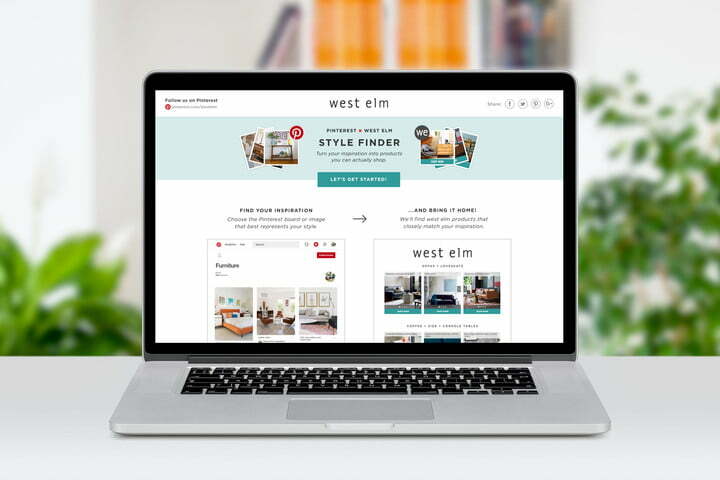 For decor giant West Elm, that meant using Clarifai’s technology to build its Stylefinder. This app lets customers link out to a Pinterest board, like that of a friend or partner, so its platform can look at, understand, and learn the tastes of the board’s creator. It then asks them to select what room they are looking to buy items for and quickly finds the best matching items from West Elm’s extensive inventory. The customer gets suggestions from multiple furnishing categories like rugs, chairs, art, and planters, but with every item matching the board owner’s aesthetic. This makes it easy for users to find complementary items, and perfect for people looking to buy their loved one more than one gift. If a customer doesn’t find any item that matches with the desired decor style, the algorithm still learns, allowing the retailer to identify whether there are any gaps in its inventory, so customers can always come back another time to see if there’s anything they love. AI is already helping shoppers to find what they want and like from online retailers and businesses. As the peak of gift shopping season continues, let AI take the stress out of trying to find for the perfect gifts for your friends and family, so you can relax and have a happy holiday!